Regrets? A few……but one in particular. Anyway, it resurrected thoughts of an incident in my life that is one of my biggest regrets. It happened over 25 years ago while I was visiting the Vietnam Memorial with a friend. We were looking for the name of one of our fraternity brothers who had died in Vietnam. A lady, who was probably in her early 60’s, was standing alone at the wall just a couple of yards away. She was reaching out ever so gently and touching a name engraved in the wall. As she turned toward us, she was weeping. I could only assume that the name she had tenderly caressed was her son and this was the only contact she would ever have with him again. I ached for this woman and wanted desperately to go up to her and just envelop her in my arms and tell her everything was alright. But it wasn’t and I didn’t. It took her a few minutes to release herself from the despair and then she was gone. That missed opportunity to reach out to her has stuck with me ever since. It was truly a time to help heal and show compassion to another traveler of life’s rocky road. A kind word, a caring touch or even just an understanding glance. But I blew it. That’s pretty much all I remember from the trip to DC that weekend. A rare moment turned into a regrettable one. I still wonder who she was and what her life has been like since that day. I hope it has been as blessed as mine. I hope she found comfort from others around her. She certainly deserved at least that. But she taught me something valuable that day. Since then I have never missed a chance to hug someone who needed a spiritual or emotional lift. Family, friends or strangers…..there’s really no difference. 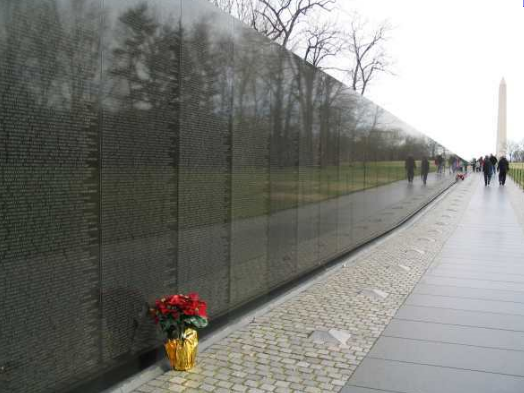 This entry was posted in Misc and tagged friendship, Vietnam Memorial. Bookmark the permalink. 8 Responses to Regrets? A few……but one in particular. Glad you sent me to this post, Al. Very touching. It’s so hard to know how to respond sometimes. Some people don’t like to be touched, and others need a hug so bad. It’s just important to make some response, even if it’s, as you said, just a knowing glance to acknowledge that person. Thanks. The emotions you felt with the homeless man struck me as very similar. To your credit, you did something about it. I have one that haunts me. I was visiting my Aunt in Syracuse, where my Grandma lived…I was with my mother and son Jeff who was about 3. Grandma was 89 and in bed and as I was walking down the hall, I stopped, looked in, and she said “Cindy, everynight before I go to sleep I pray that the Lord will take me”. How I wish I had gone in to talk to her! But I froze, couldn’t respond…what was I…too young, too immature? Here you are taking care of vets and you remember the incident at the wall…and I’ve spent years with the elderly…especially women. Maybe these things were supposed to happen the way they did. That’s a touching story Cindy. I think you’re right. Those incidents probably affected our lives in positive ways that we don’t even realize. I know several folks who would give you an argument Bernice but thank you. You always have a positive spin on things. It’s an endearing quality.